The 22,500 MW Three Gorges Dam hydroelectric power plant in China, the largest hydroelectric power station in the world. The energy import was three times bigger in 2009 compared to 2004. The share of energy import of the primary energy use was 12% in 2009. The country is the world's largest emitter of greenhouse gases, with carbon emission growth of 44% from 2004 to 2009. However, from 2010 to 2015 China reduced energy consumption per unit of GDP by 18%, and CO2 emissions per unit of GDP by 20%. On a per-capita basis, it was the world's 42nd largest emitter of greenhouse gases in 2014. China is also the world's largest renewable energy producer. China is the largest producer of hydroelectricity, solar power and wind power in the world. Energy policymaking in China is largely decentralised. There has been no Ministry of Energy since it was dissolved in 1993, and it was only in 2002–2003 that serious governmental dialogue on re-centralising energy administration began. 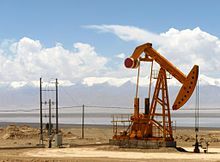 China’s energy industries are governed by a number of ministries and commissions, and companies with varying levels of power and influence, such as the China National Petroleum Corporation (CNPC) and the China Petroleum and Chemical Corporation (Sinopec). Both of these companies originally comprised one ministry before being converted to state companies in the 1980s. They have retained the same hierarchical rank as government ministries, putting them higher than the sub-ministerial bureau charged with supervising them. These complicated organisational structures and interrelationships complicate any efforts to change the way energy is priced and billed. Mtoe = 11.63 TWh, excludes Hong Kong. On June 19, 2007, the Netherlands Environmental Assessment Agency announced that a preliminary study had indicated that China's greenhouse gas emissions for 2006 had exceeded those of the United States for the first time. The agency calculated that China’s CO2 emissions from fossil fuels increased by 9% in 2006, while those of the United States fell by 1.4%, compared to 2005. The study used energy and cement production data from British Petroleum which they believed to be 'reasonably accurate', while warning that statistics for rapidly changing economies such as China are less reliable than data on OECD countries. The Initial National Communication on Climate Change of the People's Republic of China calculated that carbon dioxide emissions in 2004 had risen to approximately 5.05 billion metric tons, with total greenhouse gas emissions reaching about 6.1 billion metric tons carbon dioxide equivalent. In 2002, China ranked 2nd (after the United States) in the list of countries by carbon dioxide emissions, with emissions of 3.3 billion metric tons, representing 14.5% of the world total. However, due to its huge population size (the largest in the world), it only ranked 43 in the list of countries by carbon dioxide emissions per capita, with emissions of 7.6 metric tons per person (compared to 16.4 metric tons per person in the United States). In addition, it has been estimated that around a third of China's carbon emissions in 2005 were due to manufacturing exported goods. Since 2006, China has overtaken the USA, producing 8% more emissions than the US to become the worlds biggest emitter of pollution. In the industrial sector, six industries – electricity generation, steel, non-ferrous metals, construction materials, oil processing and chemicals – account for nearly 70% of energy use. In the construction materials sector, China produced about 44% of the world's cement in 2006. Cement production produces more carbon emissions than any other industrial process, accounting for around 4% of global carbon emissions. China has been taking action on climate change for some years, with the publication on June 4, 2007 of China's first National Action Plan on Climate Change, and in that year China became the first developing country to publish a national strategy addressing global warming. The plan did not include targets for carbon dioxide emission reductions, but it has been estimated that, if fully implemented, China's annual emissions of greenhouse gases would be reduced by 1.5 billion tons of carbon dioxide equivalent by 2010. Other commentators, however, put the figure at 0.950 billion metric tons. The publication of the strategy was officially announced during a meeting of the State Council, which called on governments and all sectors of the economy to implement the plan, and for the launch of a public environmental protection awareness campaign. The National Action Plan includes increasing the proportion of electricity generation from renewable energy sources and from nuclear power, increasing the efficiency of coal-fired power stations, the use of cogeneration, and the development of coal-bed and coal-mine methane. In addition, the one child policy in China has successfully slowed down the population increase, preventing 300 million births, the equivalent of 1.3 billion tons of CO2 emissions based on average world per capita emissions of 4.2 tons at 2005 level. In January 2012, as part of its 12th Five-year Plan, China published a report 12th Five-year Plan on Greenhouse Emission Control (guofa  No. 41), which establishes goals of reducing carbon intensity by 17% by 2015, compared with 2010 levels and raising energy consumption intensity by 16%, relative to GDP. More demanding targets were set for the most developed regions and those with most heavy industry, including Guangdong, Shanghai, Jiangsu, Zhejiang and Tianjin. China also plans to meet 11.4% of its primary energy requirements from non-fossil sources by 2015. The plan will also pilot the construction of a number of low-carbon Development Zones and low-carbon residential communities, which it hopes will result in a cluster effect among businesses and consumers. In addition, the Government will in future include data on greenhouse emissions in its official statistics. In a separate development, on January 13, 2012, the National Development and Reform Commission announced that the cities of Beijing, Tianjin, Shanghai, Chongqing and Shenzhen, and the provinces of Hubei and Guangdong would become the first to participate in a pilot carbon cap and trade scheme that would operate in a similar way to the European Union Emission Trading Scheme. The development follows an unsuccessful experiment with voluntary carbon exchanges that was set up in 2009 in Beijing, Shanghai and Tianjin. Coal remains the foundation of the Chinese energy system, covering close to 70 percent of the country’s primary energy needs and representing 80 percent of the fuel used in electricity generation. Coal has grown rapidly in importance in recent years along with the rising demand for electricity. 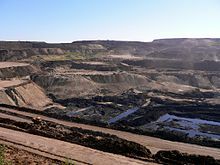 In 2011, according to the IEA, Chinese coal production was equivalent to 3,576 Mt*0.522 toe/Mt*11.630 TWh/toe = 21,709 TWh. Assuming the same caloric value for the imported coal, the net coal energy available would be 22,784 TWh. Equally calculated available coal was 17,000 TWh in 2008 and 22,800 TWh in 2011, with increase of 5,800 TWh in three years. Total renewable energy in China was 3,027 TWh in 2008 and 2,761 TWh in 2005, with increase of 266 TWh in three years. Same period from 2005 to 2008 annual coal use increased 3,341 TWh. China's coal supply was in 2009 18,449 TWh which was 47% of the world coal supply. China is the world's top coal producer and ranks third in the amounts of coal reserves. It is approximately self-sufficient in coal, with a production of 2.38 billion ton and a consumption of 2.37 billion tons in 2006. Top 10 hard and brown coal producers in 2010 (2009) were (Mt): China 3,162 (2,971), United States 997 (985), India 571 (561), Australia 420 (399), Indonesia 336 (301), Russia 324 (297), South Africa 255 (247), Kazakhstan 111 (101), Poland 134 (135) and Colombia 74 (73). In 2010 China was second highest hard coal importer (157 Mt). China consumes more coal than any other country. Its share of the world coal production was 48% in 2009 and 28% in 2000. Coal use in the world increased 48% from 2000 to 2009. In practice, the majority of this growth occurred in China and the rest in other parts of Asia. In China, coal usage doubled between 2003 and 2007. China's oil supply was 4,855 TWh in 2009 which represented 10% of the world's supply. Although China is still a major crude oil producer, it became an oil importer in the 1990s. China became dependent on imported oil for the first time in its history in 1993 due to demand rising faster than domestic production. In 2002, annual crude petroleum production was 1,298,000,000 barrels, and annual crude petroleum consumption was 1,670,000,000 barrels. In 2006, it imported 145 million tons of crude oil, accounting for 47% of its total oil consumption. By 2014 China was importing approximately 7 mil. barrels of oil per day. Three state-owned oil companies – Sinopec, CNPC, and CNOOC – dominate its domestic market. China announced on June 20, 2008 plans to raise petrol, diesel and aviation kerosene prices. This decision appeared to reflect a need to reduce the unsustainably high level of subsidies these fuels attract, given the global trend in the price of oil. Top oil producers were in 2010: Russia 502 Mt (13%), Saudi Arabia 471 Mt (12%), US 336 Mt (8%), Iran 227 Mt (6%), China 200 Mt (5%), Canada 159 Mt (4%), Mexico 144 Mt (4%), UAE 129 Mt (3%). The world oil production increased from 2005 to 2010 1.3% and from 2009 to 2010 3.4%. China's natural gas supply was 1,015 TWh in 2009 that was 3% of the world supply. CNPC, Sinopec, and CNOOC are all active in the upstream gas sector, as well as in LNG import, and in midstream pipelines. Branch pipelines and urban networks are run by city gas companies including China Gas Holdings, ENN Energy, Towngas China, Beijing Enterprises Holdings and Kunlun Energy. Issued by China’s State Council in September 2013, China’s Action Plan for the Prevention and Control of Air Pollution illustrates government desire to increase the share of natural gas in China’s energy mix. In May 2014 China signed a 30-year deal with Russia to deliver 38 billion cubic metres of natural gas each year. China was top seventh in natural gas production in 2010. Liujiaxia Dam in Gansu, China. This is an increase from 2009, when China's total annual electricity output was 3.71465 trillion kWh, and the annual consumption was 3.6430 trillion kWh (second largest in the world). In the same year, the total installed electricity generating capacity was 874 GW. China is undertaking substantial long distance transmission projects with record breaking capacities, and has the goal of achieving an integrated nationwide grid in the period between 2015 and 2020. In 2015, China generated 73% of its electricity from coal-fired power stations, which has been dropping from a peak of 81% in 2007. China is the world's leading renewable energy producer, with an installed capacity of 152 GW. China has been investing heavily in the renewable energy field in recent years. In 2007, the total renewable energy investment was $12 billion USD, second only to Germany. In 2012, China invested $65.1 billion USD in clean energy (20% more than in 2011), fully 30% of the total investment by the G-20, including 25% ($31.2 billion USD) of global solar energy investment, 37% percent ($27.2 billion USD) of global wind energy investment, and 47% ($6.3 billion USD) of global investment in "other renewable energy" (small hydro, geothermal, marine, and biomass); 23 GW of clean generation capacity was installed. China is also the largest producer of wind turbines and solar panels. Approximately 7% of China's energy was from renewable sources in 2006, a figure targeted to rise to 10% by 2010 and to 16% by 2020. 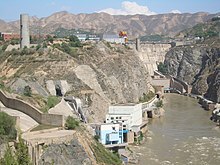 The major renewable energy source in China is hydropower. Total hydro-electric output in China in 2009 was 615.64 TWh, constituting 16.6% of all electricity generated. The country already has the most hydro-electric capacity in the world, and the Three Gorges Dam is currently the largest hydro-electric power station in the world, with a total capacity of 22.5 GW. It has been in full operation since May 2012. In 2012, China had 15 nuclear power units with a total electric capacity of 11 GW and total output of 54.8 billion kWh, accounting for 1.9% country's total electricity output. This rose to 17 reactors in 2013. By 2016 the number of operating nuclear reactors was 32 with 22 under construction and other dozen to start construction this year. There are plans to increase nuclear power capacity and nuclear power percentage, bringing the total electricity output to 86 GW and 4% respectively by 2020. Plans are to increase this to 200 GWe by 2030, and 400 GWe by 2050. China has set an end-of-the-Century goal 1500GWs of nuclear energy, most of this from fast reactors. China has 32 reactors under construction, the highest number in the world. Following the completion of the similar Township Electrification Program in 2005, the Village Electrification Program plans to provide renewable electricity to 3.5 million households in 10,000 villages by 2010. This is to be followed by full rural electrification using renewable energy by 2015. Although a majority of the renewable energy in China is from hydropower, other renewable energy sources are in rapid development. In 2006, a total of 10 billion US dollars had been invested in renewable energy, second only to Germany. In 2006, 16 million tons of corn have been used to produce ethanol. However, because food prices in China rose sharply during 2007, China has decided to ban the further expansion of the corn ethanol industry. On February 7, a spokesman for the State Forestry Administration announced that 130,000 square kilometres (50,000 sq mi) would be devoted to biofuel production. 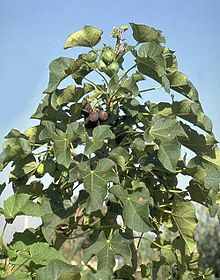 Under an agreement reached with PetroChina in January 2007, 400 square kilometres of Jatropha curcas is to be grown for biodiesel production. Local governments are also developing oilseed projects. There are concerns that such developments may lead to serious environmental damage. China has become the world's largest consumer of solar energy. It is the largest producer of solar water heaters, accounting for 60 percent of the world’s solar hot water heating capacity, and the total installed heaters is estimated at 30 million households. Solar PV production in China is also in rapid development. In 2007, 0.82 GW of Solar PV was produced, second only to Japan. As part of the stimulus plan of "Golden Sun", announced by the government in 2009, several developments and projects became part of the milestones for the development of solar technology in China. These include the agreement signed by LDK for a 500MW solar project, a new thin film solar plant developed by Anwell Technologies in Henan province using its own proprietary solar technology and the solar power plant project in a desert, headed by First Solar and Ordos City. The effort to drive the renewable energy use in China was further assured after the speech by the Chinese President, given at the UN climate summit on 22 Sept 2009 in New York, pledging that China will plan to have 15% of its energy from renewable sources within a decade. China is using solar power in houses, buildings, and cars. China's total wind power capacity reached 2.67 gigawatts (GW) in 2006, 6.05 GW by 2007, 12.2 GW by 2008, 25 GW by 2009, and 44.7 GW by 2010, making China the world leader in installed wind power generation capacity. Officials were warned that violating energy conservation and environmental protection laws would lead to criminal proceedings, while failure to achieve targets would be taken into account in the performance assessment of officials and business leaders. After achieving less than half the 4% reduction in energy intensity targeted for 2006, all companies and local and national government were asked to submit detailed plans for compliance before June 30, 2007. During the first four years of the plan, energy intensity improved by 14.4%, but dropped sharply in the first quarter of 2010. In August 2010, China announced the closing of 2,087 steel mills, cement works and other energy-intensive factories by September 30, 2010. The factory closings were made more palatable by a labor shortage in much of China making it easier for workers to find other jobs. A State Council circular issued on June 3, 2007, restricts the temperature of air conditioning in public buildings to no lower than 26 °C in summer (78.8 °F), and of heating to no higher than 20 °C (68 °F) in winter. The sale of inefficient air conditioning units has also been outlawed. Chinese billionaires in energy business by Forbes included in 2013 Wang Yusuo & family ($2.4 B) the chairman of ENN Group, one of China's largest non-government-controlled energy businesses and Huo Qinghua ( $1.1 B) chairman of China Kingho Energy Group, one of the country's largest privately held mining and energy companies, with operations in China, Africa and Mongolia. and in Hong Kong Sit Kwong Lam ($1.35 B) the founder and chairman of Hong Kong-listed Brightoil Petroleum. 88% are concerned about climate change. 97% think their Government should do more to tackle global warming. 63% think that China is too dependent on fossil fuels. 56% think that China is too reliant on foreign oil. 91% think that a minimum 25% of electricity should be generated from renewable energy sources. 61% are concerned about nuclear power. 79% are concerned about carbon dioxide emissions from developing countries. 62% think it appropriate for developed countries to demand restrictions on carbon dioxide emissions from developing countries. Another survey published in August 2007 by China Youth Daily and the British Council sampled 2,500 Chinese people with an average age of 30.1. It showed that 80% of young Chinese are concerned about global warming. In December 2011 in Haimen, Guangdong, a coastal town of about 120,000 people, residents have protested ongoing for three days (22.12.2011) against plans for another coal-fired power plant. Police were armed with batons and shields and fired teargas to break up demonstrations. ^ a b c d Andrews-Speed, Philip (November 2014). "China's Energy Policymaking Processes and Their Consequences". The National Bureau of Asian Research Energy Security Report. Retrieved December 5, 2014. ^ Catherine Brahic (April 25, 2007). "China's emissions may surpass the US in 2007". New Scientist. Retrieved 2007-05-20. ^ Saeed Shah (November 8, 2006). "China to pass US greenhouse gas levels by 2010". The Independent. UK. Archived from the original on September 30, 2007. Retrieved May 20, 2007. ^ "China fears disasters, grain cut from global warming". Reuters AlertNet. December 27, 2006. Retrieved 2007-05-20. ^ Ma Tianjie (6 August 2016). "China's 5 Year Plan for Energy". The Diplomat. Retrieved 30 October 2016. ^ "CO2 emissions (metric tons per capita)". World Bank. Retrieved 5 October 2018. ^ a b c Alok Jha (2008-08-01). "China 'leads the world' in renewable energy". The Guardian. Retrieved 2011-02-02. ^ a b c Grant, Dansie; Marc, Lanteigne; Overland, Indra (2010-02-01). "Reducing Energy Subsidies in China, India and Russia: Dilemmas for Decision Makers". Sustainability. 2. doi:10.3390/su2020475. 2 emissions; USA in second position". Netherlands Environmental Assessment Agency. 2007-06-19. Retrieved 2007-07-20. 2 emissions; USA in second position: more info". Netherlands Environmental Assessment Agency. June 19, 2007. Archived from the original on July 1, 2007. Retrieved 2007-07-20. ^ "Current greenhouse gas emissions in China". Xinhua News Agency. 2007-06-04. Retrieved 2007-06-04. 2 (CDIAC) Archived March 10, 2007, at the Wayback Machine, United Nations. Retrieved 2005-04-09. ^ "World Development Indicators". The World Bank. 2013. ^ Catherine Brahic (2008-07-29). "33% of China's Carbon Footprint Blamed on Exports". ABC News. Retrieved 2008-07-29. ^ a b China says energy efficiency key to performance of government & company leaders, Xinhua News Agency, published 2007-06-03. Retrieved 2007-06-04. ^ a b c "China to Cut Greenhouse Emissions by 950 Million Tons". Bloomberg. 2007-06-02. Retrieved 2007-06-04. ^ "National Action Plan on Climate Change". Xinhua News Agency. 2007-06-02. Retrieved 2007-06-04. ^ "China unveils climate change plan". BBC. 2007-06-04. Retrieved 2007-06-04. ^ "China says one-child policy helps protect climate". Reuters. 2007-08-30. Retrieved 2007-08-30. ^ a b c d e f g Vivian Ni (2012-01-18). "China Sets New Greenhouse Gas Emission Reduction Goals". China Briefing. Retrieved 2012-01-18. ^ a b "Energy in Sweden 2010, Facts and figures Table 52 Global supply of coal, 1990–2009 (TWh)". 2010. Archived from the original on October 16, 2013. ^ "China's coal imports hit new high". Peoples Daily Online. 2007-04-19. Retrieved 2011-02-02. ^ Andrew Freedman (5 July 2011). "New study blames 10-year lull in global warming on China coal use, air pollution". Washington Post. Retrieved 26 June 2013. ^ Carrington, Damian (25 July 2016). "China's coal peak hailed as turning point in climate change battle". The Guardian. Retrieved 2016-07-25. ^ Qi, Ye; Stern, Nicholas; Wu, Tong; Lu, Jiaqi; Green, Fergus (25 July 2016). "China's post-coal growth". Nature Geoscience. doi:10.1038/ngeo2777. ^ "China's oil imports set new record". Bloomberg BusinessWeek. Archived from the original on May 22, 2011. Retrieved 2011-02-02. ^ "China's 2006 crude oil imports 145 mln tons, up 14.5 pct - customs - Forbes.com". November 19, 2007. Archived from the original on November 19, 2007. Retrieved April 6, 2018. ^ "COUNTRY COMPARISON :: ELECTRICITY - PRODUCTION". CIA. Retrieved 2014-06-20. ^ "China Bureau of Statistics 2009年国民经济和社会发展统计公报". Stats.gov.cn. Archived from the original on February 28, 2010. Retrieved February 2, 2011. ^ "China's National Development and Reform Commission: 2009年全社会用电量稳定增长 清洁能源快速发展". Ndrc.gov.cn. Archived from the original on September 28, 2011. Retrieved February 2, 2011. ^ "China installed capacity hits 710 GW in 2007". Uk.reuters.com. 2008-01-09. Retrieved 2011-02-02. ^ Xiaoxin Zhou of Electric Power Research Institute,China (2001-06-27). "Power System Development and Nationwide Grid Interconnection in China" (PDF). Workshop on Power Grid Interconnection in Northeast Asia, Beijing, China, May 14–16, 2001. Nautilus Institute: 42. Archived from the original (PDF) on February 25, 2009. Retrieved 2008-12-18. ^ Kinver, Mark (2008-08-01). "China's 'rapid renewables surge'". BBC News. Retrieved 2011-02-02. ^ Bradsher, Keith (2010-01-30). "China leads global race to make clean energy". The New York Times. ^ "China's nuclear plants generate 74.8 TWh of electricity in 2011". 2007-04-23. Retrieved 2007-06-22. ^ "PRIS - Country Details". Iaea.org. Retrieved 2013-09-24. ^ "Renewables Global Status Report 2006 Update" (PDF). REN21. 2006. Archived from the original (PDF) on July 18, 2011. Retrieved 2007-05-16. ^ China corn for ethanol 16 m tons in 2006, published 2007-04-09. Retrieved 2007-08-27. ^ Chinese Biofuels Expansion Threatens Ecological Disaster, Worldwatch Institute, published 2007-03-13. Retrieved 2007-06-28. ^ Energy: China becomes the world's largest solar power market published 2007-08-27. Retrieved 2007-08-27. ^ Kunming Heats Up as China’s “Solar City” published 2007-06-15. Retrieved 2007-08-27. ^ "LDK to develop 500 MW of PV power in China". PennWell. 1 Sep 2009. ^ "Anwell Produces its First and Thin Film Solar Panel". Solarbuzz. September 7, 2009. ^ "First Solar to Team With Ordos City on Major Solar Power Plant in China Desert". First Solar. September 8, 2009. Archived from the original on March 3, 2016. Retrieved September 25, 2009. ^ China to stick to strict environment-protection plans, Xinhua News Agency, published 2007-06-03. Retrieved 2007-06-04. ^ Chinese government urges efforts for energy saving, Xinhua News Agency, published 2007-06-03. Retrieved 2007-06-04. ^ In Crackdown on Energy Use, China to Shut 2,000 Factories, The New York Times, published 2010-08-09. Retrieved 2010-11-07. ^ State Council: no lower than 26 degrees in air-conditioned rooms, Xinhua News Agency, published 2007-06-03. Retrieved 2007-06-04. ^ "The World's Billionaires". Forbes. Retrieved February 1, 2016. ^ First Annual World Environment Review Poll Reveals Countries Want Governments to Take Strong Action on Climate Change Archived October 22, 2013, at the Wayback Machine, Global Market Insite, published 2007-06-05. Retrieved 2007-05-09. ^ China's young favor sustainable consumption, but want cars first published 08-20-2007. Retrieved 08-28-07. China Clean Energy Program—An initiative of the Natural Resources Defense Council, in close partnership with China's South North Institute on Sustainable Development. Cleaner Production in China—Current and comprehensive information source on China's campaign to reduce pollution.